My cucumber plant is finally hermaphroditic! I don't know whether you all remember my upset last week at the unfortunate monosexuality of my fire escape cucumber plant. What happened was that it occurred to me that all alone on a 4th story fire escape in New York, a vegetable might have trouble attracting enough pollinators to bear fruit. 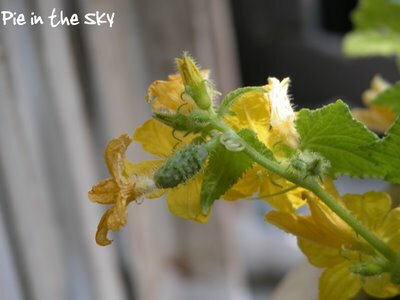 I thus began researching hand-pollination, and learned the logistics: basically, many varieties of cucumber plants produce both male and female blossoms (you can tell them apart easily because the female blossoms have tiny little cucumbers-to-be at the base), and insects and the wind help them pollinate one another. In the absence of pollinators, pollinating can be done by hand with a Q-tip or similar item. So I got my Q-tip at the ready and crawled out to investigate my plant...and found that it had all male flowers! Dismayed, I researched further and learned that sometimes plants behave this way in response to transplant truama or cramped root systems. Since my little cukes are in a pot on the fire escape, I figured that the size of the pot was surely the problem, and that I'd not have any cucumbers this year. So i tried my best to just enjoy the flowers in all their perky little beauty. But then yesterday - at noon on the summer solstice, no less - I leaned out the window to water the spearmint and what should I spy but a lovely lady blossom! On further inspection, I found three others. Cucumbers may be had this summer, after all. I've had two pretty little ripe cherry tomatoes...William picked one and I just enjoying looking at the other. :) I think the plant came with those two blooms.